This book is large-format (12" x 9" / 30 x 23 cms) with large, clear full page photographs of 26 different samplers. 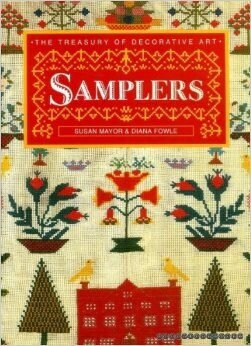 Sampler lovers eye candy!! In years gone by, many young needlewomen practised their skills and demonstrated their achievements in embroidered samplers. These colourful pieces were initially worked as a reference sheet recording abstract pictures and stitches for future use. But they gradually turned into decorative pictures to be hung on the wall, their alphabets and uplifting verses intended to instruct both the embroiderer and the viewer. The 26 large-format plates in this collection represent all kinds of samplers, in cotton, silk and wool. An authoritative commentary by Susan Mayor and Diana Fowle traces their history from the sixteenth to the nineteenth centuries. This book will delight and inspire everybody with in interest in needlework, from historians and designers to enthusiastic embroiderers and collectors.